Dig through your Lego box and find some fun pieces. If you don't have a stash of Lego pieces, Lego.com has a Pick-a-Brick section that you can select just the pieces you need. You can get all the main pieces for this for about $2 and then decorate it with Star Wars accessories. 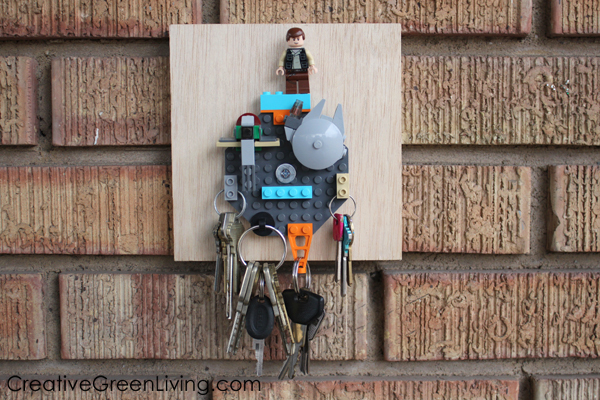 Deploy your master builder skills and build a fun backdrop to hang your keys on. I made my Lego keychain holder so that none of the Lego pieces had to be altered. No Lego pieces were harmed making this keychain holder. Put a couple flat bricks on the backside of the baseplate. Place the 2x6 plates on the backside of the octagon plate. Add the angle plate at the top of the octagon. The added plates to the backside make it so there is enough room for the Star Wars minifigure to stand guard over the keys. Add a 1x4 brick on top of the angle piece. Add another 1x4 on the baseplate to add some color in the middle. Use the round 1x1 to add some height for the mini Lego Millennium Falcon to sit on. Attach the mini Millenium Falcon. This little Lego Millenium Falcon is my favorite Lego build ever. It was included with the 2011 Advent Calendar set...the GREAT news, is that an upgraded version is included with the 2017 Lego Star Wars Advent Calendar set too! Get it, it's adorable! Add your Star Wars minifigure to the top to stand guard. I picked Han Solo, because Han is my favorite. Who would trust to guard your keys? Add another mini ship, like Slave 1, to make it look amazing. Now hook a Lego piece with a hole in it through your keyring and it's ready to hang! I really tested the limit of this holder with the biggest and heaviest keys I could find. It is perfect, not even the heaviest keychain budged. Next step is to strengthen it a little and make it easy to hang up on the wall. Take everything off the baseplate except the 2 back plates. Use the hammer and pound the hanging hardware into the back of the wood piece. This makes it so easy to hang on just a simple nail. Place the washer on the screw and then use the screwdriver to secure the baseplate on the wood, near the bottom edge. Now build up the Lego scene again and it's ready to hang up. Now enjoy the best keychain holder in the galaxy!